Mark Twain was born on November 30th, 1835 and died on April 21st, 1910. In those seventy-five years, he was able to obtain the prestige and notoriety in which few writers can claim. Dubbed the “greatest satirist of the 20th century”, Twain changed the landscape of literary prose. Through his caustic criticism and violent animosity to all things hypocritical, he expressed all of his opinions via the plethora of books, essays and short stores he manufactured throughout his career. Either hated or loved by those who read him, his influence on American culture is widely prevalent. Regardless of opinions towards the author, he is greatly respected and known by all. 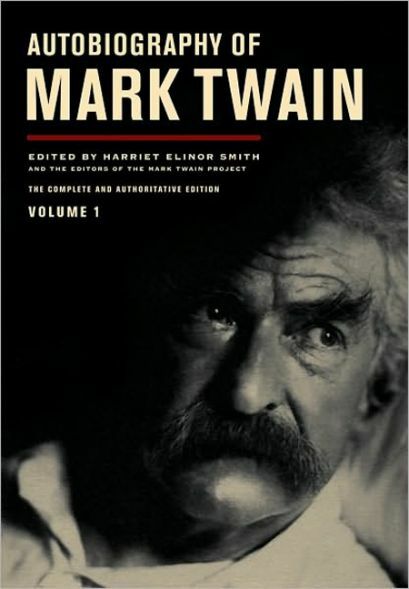 In his will, Twain requested that the manuscript of his autobiography, which he wrote several years before his death, was to be published a hundred years after his death. At the time of his death Twain was well known for his controversial published works, but even this maneuver seemed a bit extreme for him. Due to his immense popularity, several excerpts of his autobiography were published in advance. However, the wishes of his will were mostly kept intact, and the official release did not occur until November of this year. The autobiography will consist of several parts, each being released at different times. Volume one discusses Twain’s early childhood to teenage years. Of course, no Twain piece would be complete without several pages of diatribes and musings, and these are scattered within the autobiography. Whether it is a vehement attack on slavery or the denouncing of his publisher, Twain elegantly interpolates his style with his trademark talent of description. The Adventures of Tom Sawyer, published in 1876, placed Twain on the American literary scene as an ingenious storyteller and expert setting descriptor. But the sequel to this classic tale, The Adventures of Huckleberry Finn, did not receive such a glorious review. By far the more controversial of the two, Huck Finn caused massive outage throughout the country, especially in the South, where the story was set. It is through this story that Twain’s negative opinions regarding slavery and southern code are expressed. The novel was years ahead of its time, and as a result was not widely accepted by American culture at the time. The autobiography expands upon Twain’s opinions tenfold. By the end of his life, Twain had become hypercritical of every aspect of society. He even wrote a series of short essays in which he took the role of the devil and condemned the actions of humanity. It is apparent that if the autobiography was released in 1910, it would be too much for the public to interpret and thus would have been deemed as controversial and swept under the rug. Twain predicted this and decided to have it released in 2010. Every biting satire and brutal depiction makes Twain’s writing even more intriguing and appealing to the senses. This autobiography has solidified Twain’s place in history.